With over 200,000 mouth and jaw injuries each sporting year protection is essential. A professionally made mouth guard will protect your teeth, reduce the incidence of the oral lacerations and will also help prevent jaw breakage and concussion. Bear in mind the cost of replacing just one tooth can exceed $2000, not to mention the discomfort and inconvience of losing teeth. 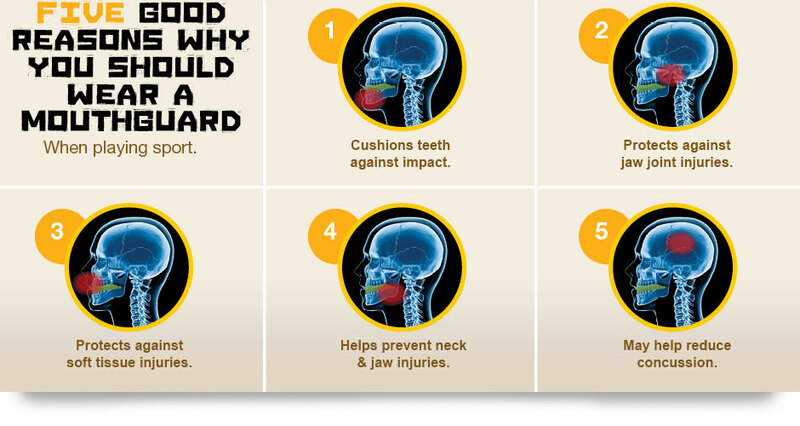 So play with the confidence and safety only a professionally made mouthguard can give. D-Fence custom laminated mouthguards are made from the highest quality materials using the latest laminating techniques. D-Fence Mouthgaurds have hundereds of colours and designs - the choice is yours. Every D-Fence Mouthgaurd is custom made to suit each individual and each sport. Our mouth guars fit comfortably and accurately, unlike over the counter varities, D-Fence Mouthguards will not impede breathing or restrict speech and are guaranteed to fit for the season. All D-Fence Mouthguards have a permanent identification strip (name & phone number) and come with a storage case. They also have tapered edges for ultimate comfort.